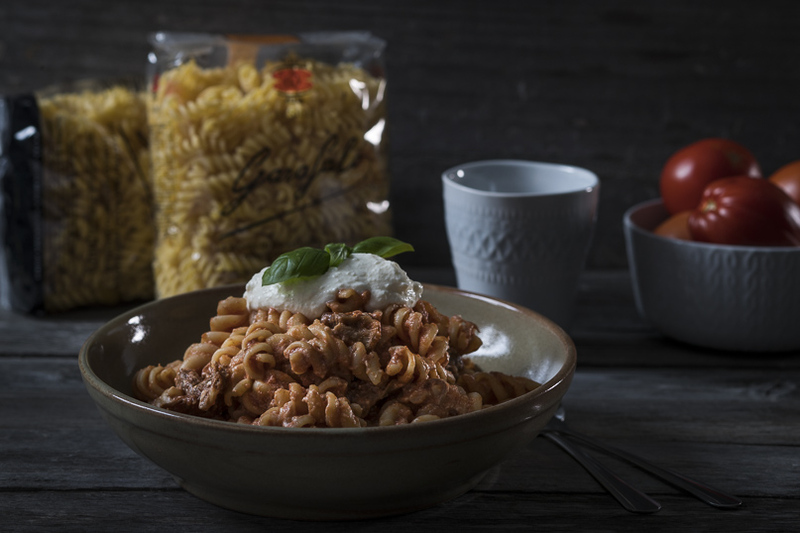 Another great recipe using the best dried pasta, Pasta Garofalo #Napolicious ! This traditional recipe from Naples is a fast and simple but delicious way to feed to family and lower food wastage, by using left over pasta sauce. Garofalo pasta is easy to cook and consistent on quality ever time! Now available in Australia where good food is sold!! Place a large pot of salted water, on high heat, on the stove, and bring water to the boil. Whilst the water in coming up to the boil, place the left-over Ragu in a medium saucepan and heat on the stove on a low heat. Next, place the ricotta in a medium size bowl, and lightly whisk with a fork until it is smooth and creamy, then set aside. Once the water is boiling, place the fusilli in and cook following packet directions, until al dente. Strain the fusilli and return it to the pot. Whilst the pasta is still warm, pour the ricotta in, and stir. Then pour over the now hot Ragu sauce and mix well. Season with salt and pepper to taste, then serve with a generous amount of Parmesan cheese and top with the fresh basil leaves. Serve with bread.